I graduated from Sir Allan MacNab High School in 1997 and attended OAC in 1997-98. As I went through high school, I figured out fairly quickly that I wanted to be a social worker. I was lucky enough to be born into a family that had many privileges and I wanted to help those who hadn’t been as lucky; who struggled with issues such as addiction, poverty, and illness. I applied for and was accepted at McMaster University, into the School of Social Work. 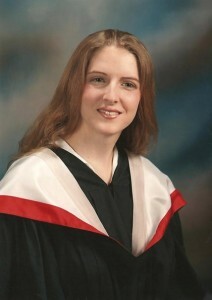 I started classes at McMaster in the fall of 1998, and graduated in 2003 with my BA/BSW. I tried to keep an eye out for any possible scholarships or bursaries, but didn’t seem to be eligible, for one reason or another. The HCF Bursary was one that I could actually apply for, and I was very excited to find it. I’ve worked at the Hamilton Children’s Aid Society for just over seven years, as a child protection worker, and it has given me a chance to use the skills I learned in university. It’s nice to know that I’m actually doing the work I hoped to do. When I was going through the social work program, I was also doing a field placement and working a part-time job. The financial help meant that I could do a few less hours at the local grocery store, and spend them studying instead. I was lucky to have a lot of help from my parents when I was going through school. Having the Chaney Ensign Bursary meant that I could stand on my own two feet a bit more, and not have as much debt at the end of my university career.